We go off road this weekend with the first of our 2015 mountain bike triathlons. The format is extremely popular and signs are that Sunday will have a good field again. Courtesy Emma Winterflood, many of you got a sneak peak at the bike course at the weekend and have now signed up for the event! Thanks Emma, the reccy ride was much appreciated by all! Registration for the event closes midnight tomorrow but why risk overlooking the cut off time, jump online now and get your entry in here. 1. Entry closes midnight tomorrow (Friday). 2. 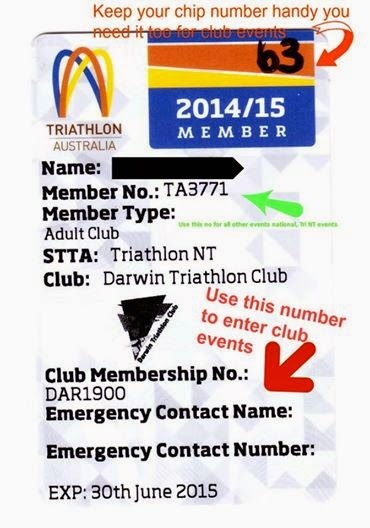 You require your DAR number and your chip number for online entry for club events (your TA number will be needed for interstate & Tri NT events but for our club events we need DAR, it is the only one we have in our database). Please assist volunteers by giving correct info when entering online. 3. Both numbers are issued at time of joining & listed in your confirmation emails. For those of you already issued with your TA Card, your Club Membership No is listed (see below) with prefix DAR. We suggest you write your club timing chip number on the top of your card and have all your tri info in one place. 4. The team from Blue Cycles NT will again be helping out and we thank them for continuing to support our events. 1. Your posts with triathlon items to buy, swap, sell or simply giveaway to a good home on DARWIN TRI – BUY | SWAP | SELL Facebook page are almost making this section redundant. If you haven’t already, send a request through Facebook to join the page. You will then be able to view items. Feel free to add your posts & include photos if you wish. A reminder that if your item sells, a comment of “sold” is appreciated by everyone. 1. Check out Higher, Faster, Stronger - a coach education forum that’s coming up, may be of interest. 2. Note to members to take care on the Howard Springs cycle path and watch out for debris on the path adjacent to the Palmerston Indigenous Village. We have been advised of sticks, rocks and trees being deliberately placed on the path earlier this week. This is the second time this year this has occurred. The debris was being cleared and the Police were notified. 3. Congratulations to our members who made the 2014 Ironman Overall All World Athlete rankings including Cath Hood (Silver), Marcus Lisle (Silver), John Arrigo (Silver), Corinne Fabian (Bronze) and Steve Goat (Bronze). 4. Former member Matt Scholar was spotted racing in his DTC club gear in Adelaide on Sunday! 5. The weather at Challenge Melbourne at the weekend was not pretty. Pro athletes Tim Green and Luke Bell were among those caught out with hypothermia in the chilly conditions. 6. Anyone competing at Ironman 70.3 Geelong at the weekend? 7. Hose the mud off the mtb and we will see you all on Sunday!